The Second Annual Graduate Conference in Qualitative Inquiry will be held on Saturday, March 30, 2019 at Northern Illinois University! Conference Agenda: The 2019 Call for Papers is available here. Please note that the location has changed to the Learning Center, Gabel Hall, NIU. The conference is open to all students, faculty, and members of the NIU community – you do not need to present a paper to attend! We request that all students, faculty and community members register in advance of the Conference. Registration is now open and is available here. 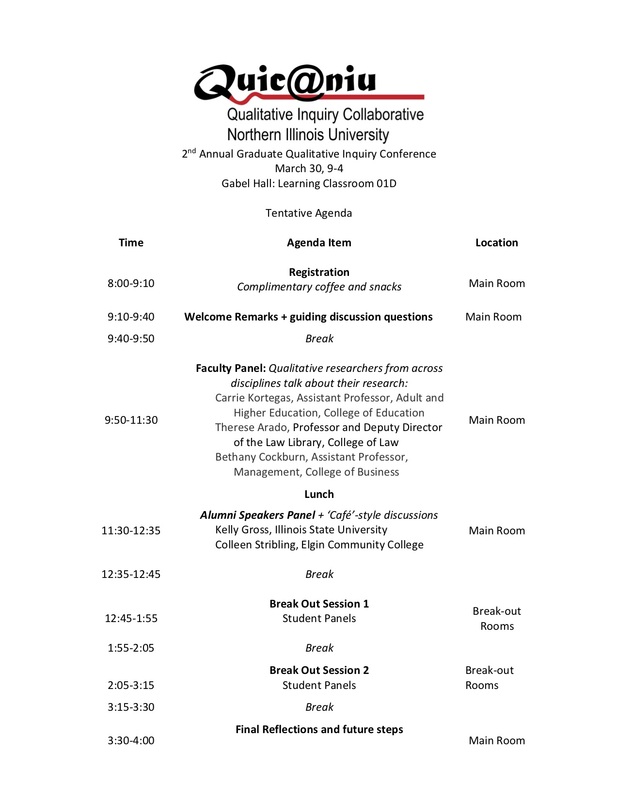 To support the rigorous development of qualitative inquiry in the social sciences, the Qualitative Inquiry Collaborative (QUIC) at Northern Illinois University will host the 2nd Annual Graduate Conference in Qualitative Inquiry, to be held at the Learning Center, Gabel Hall, NIU on Saturday, March 30, 2019. While there is no conference registration fee, $10 is required to offset the cost of the catered lunch. This daylong conference will provide NIU graduate students with the opportunity to present their original qualitative research. Presenters within individual sessions will come from a range of social science disciplines and will be linked by their methodological or conceptual approaches. Faculty discussants will be assigned to each session to further explore methodological issues in qualitative inquiry. In 2018, students and faculty facilitators came from five NIU colleges. All attendees (including presenters and audience attendees) are asked to register in advance. QUIC is grateful for the generous support of the NIU Graduate School. The First Annual QUIC Methods Café was held on Monday November 9, 2018. The advertisement poster is available here. The event brought together more than 30 graduate students and more than 10 faculty members from across disciplines at NIU to share their research expertise and workshop papers, prospectuses, dissertation chapters, and ideas-in-progress together. The First Annual Graduate Conference in Qualitative Inquiry was held on Saturday, April 7, 2018. The call for papers is available here. This event brought together more than 75 students and faculty from NIU and the wider community to workshop papers, prospectuses and dissertation chapters. Professor Elizabeth de Freitas, Professor in the Education and Social Research Institute at Manchester Metropolitan University, UK provided an outstanding keynote speech.